This is for the old Ultimate Skyblock server. Retired. 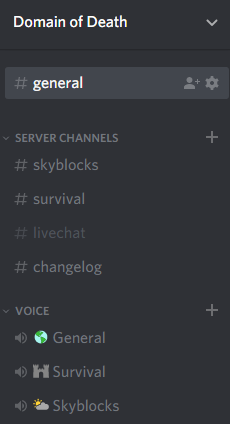 Skyblock Welcome, Guide, & FAQ! You can do "/faq" in-game for a link to this thread, or "/menu" and click the book and quill icon! If you're looking for something specific, use "Ctrl+F" and put in a keyword! Welcome to DoD Edge Network ! Skyblock, Classic Skyblock, Economy Survival, and Creative! We also have Forum Rules. You can use "/menu" in-game to open the main DoD Edge Network menu. Island Menu - Type "/is" to access the island menu to easily manage your island settings! To get to your island home quickly, type "/ih" To see all the other /is commands, type "/is help"
We have six different starter islands to choose from. To see better and more pictures with small descriptions for each one, click HERE! A medium sized island with a small pond and a few trees. Two close medium sized islands. Minimal resources with a few diamonds. A large sized starter island with already started basic farms. Default - A small starter island. The L shaped starter island. Island Levels & Ranks - As your island develops, it will gain levels. See how your island ranks compared to others using the "/is top" command. To see the level of your island, type "/is level" or look on your "/is" menu! Grief Protection - Each island has its own protected area where only the owner and their party members can build. Note: Your party members have full access to your island, so it is your responsibility to only invite people you can trust! When you place a door, chest, or other container, you can protect it so only YOU can access it by doing "/cprivate" or "/lock and left clicking it. You can add people to let them access it by doing "/cmodify (their username)" then punching the chest. You can do "/lwc" in-game for a list of commands. Party - Work alone, or invite your friends to your island party to work together on developing your island. Use the "/is invite (name)" command to invite others to your island. Warning: When they accept your invite, their inventory will be cleared! Challenges - Complete Challenges to earn exp, currency, and item rewards! To open the Challenges window quickly, type "/c"
PVP - Type "/skypvp" in-game to be brought to the Sky PVP arena! Bring your own gear to compete with others. When you die, you do NOT lose any of your things or your experience! You can buy "/perks" with in-game money for yourself and your island! Tags - You can change it at any time after you have it. Purchasing a tag also comes with items and blocks, depending on which one you choose. Use "/tags select (name)" to change your tag. To open the window to see what tags you have available to use, type "/tags"
You can also earn tags from completing certain /challenges or finding them in holiday parkour maps. There are also some in the /donor perks shop after purchasing Grass ($5) rank or higher. Emerald rank and up can obtain custom tags! 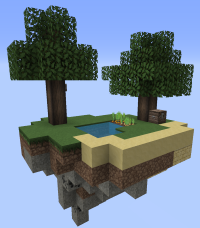 Biomes - Buy the different kinds of biomes to change your island to! You may change your biome for free after you buy it thru the "/is" menu, or type "/is biome"
Light Eater - Lower the amount of food you need to consume by slowing your hunger! 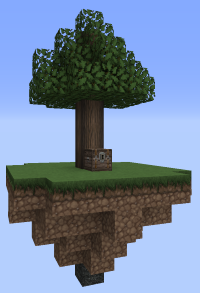 Note: This is for in the Skyblocks world only! Party Members - Buy slots to add more party members to your island! Teleport - Purchase the ability to "/tpa" and "/tpahere!" Warp - Buy a warp for your island! Other players will be able to visit you by doing "/is warp (name)" You may change the warp location after you buy it. You can also do "/is w (name)" or "/iw (name)"
Spawn Shop - Visit the shop at spawn by typing "/shop"! Here you can select the admin shop (or the island shops if you wish, a.k.a. 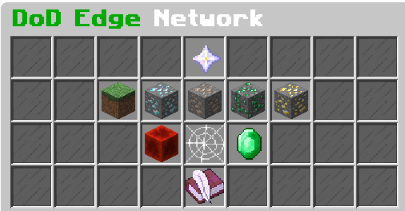 /pshop) Here you can trade DoD Currency Emeralds for items and/or blocks. 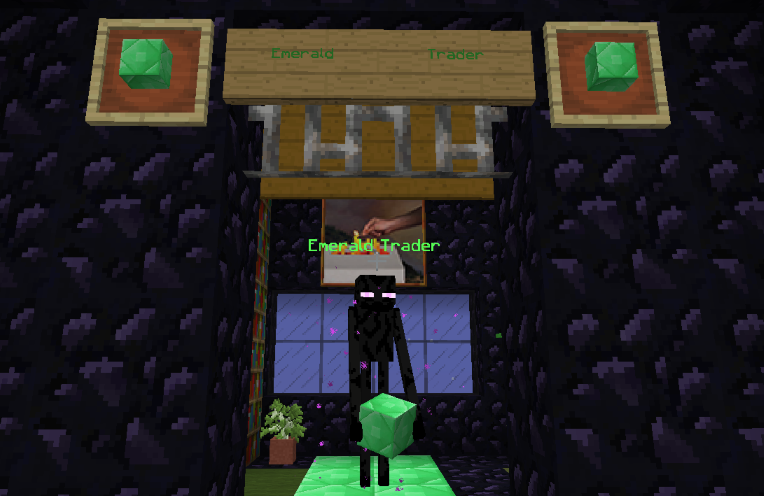 Talk to the Emerald Trader to purchase DoD Currency Emeralds, or participate in server activities like Dungeons, Parkour, and Challenges to earn them. 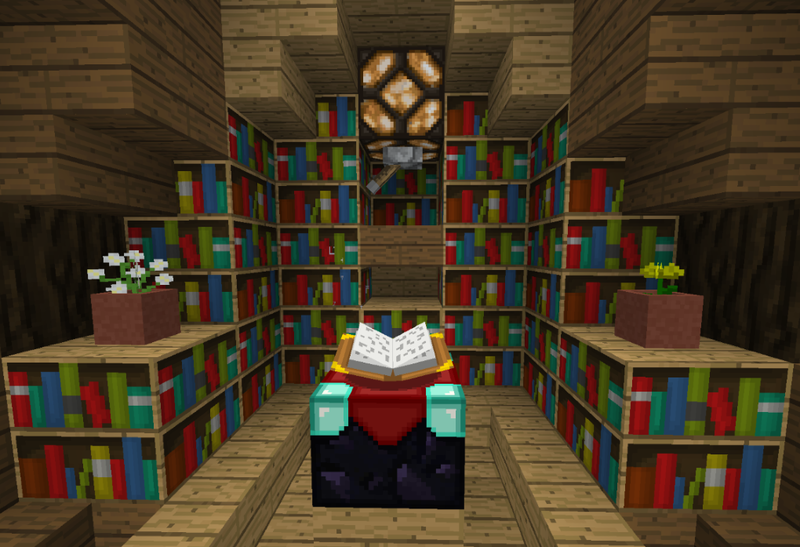 You can purchase enchants and potions in the library (/warp enchant) and alchemy shop. There is also an enchant table to use in the library, and anvils and mcmmo repair/salvage blocks in the "blacksmith" area. (/warp anvil) There are also trader NPCs in the blacksmith area for repairing SlimeFun items and gadget components, as well as upgrading gadget components. 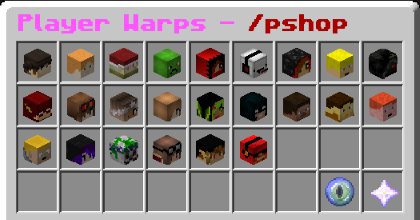 Player Shops - Type "/pshop" to open the player warps menu. You can also use /shop and choose island shops. This menu lists the names of players that have warps for their island! To get to their island, click on their button or type "/is warp (name)" When you hover over someone's name, it will either say "Shop Only" "Explore Only" or "Shop & Explore"
Parkour - Earn some extra in-game money and items by completing our challenging Parkour maps. 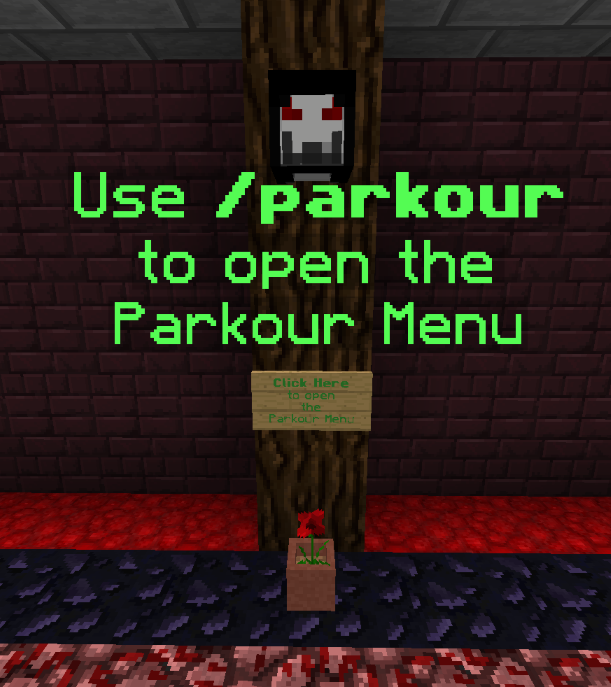 Type "/pa lobby" or "/parkour" to get to the Parkour Lobby or open the Parkour Menu. You can also use the /menu. You are able to disappear from players in Parkour. To use, simply send a “.” in chat while running a course. See info for each course by doing "/pa stats (name)" This shows how many checkpoints there are, along with the creator of the map and other info. Loot chests reset every 18 hours. Experience and currency gained when looting a parkour chest is based on what category it's in. Dungeons - Fight challenging mobs, Complete puzzles, & collect custom loot from mobs and chests to further enhance your survivability. Type "/dun" to get to the dungeon lobby. The Tower of Terror has the main dungeons. Mini dungeons are hidden throughout the map! You can also use /ft to get to dungeons quickly. Member+ - If you apply to be a Member+, you will gain a unique DoD Member+ title, receive more money from challenges, get an extra daily vote token with "/dailybonus", gain access to "/is trust", and a special Member+ Island with goodies at "/mpisland"! Fly - Vote on our listings to get "/fly" time to use on your island! Your time only goes down when you are actually flying in the air. You will get Tokens when you vote. "/tokenstore" to access the store. You can get a Key to use at the Voting Crate at "/spawn" or get 15 minute of fly time! There are other items in the Token Shop as well. MCMMO - Compete to be in the leaderboards, get bonus skills, make different kinds of blocks, get more from harvesting, do more damage with weapons and axes, and more! To see more info about MCMMO, check the main wiki page here and/or this wiki here. Shift+Right Click to activate a skill! Casino - Try your luck at the casino to win big. 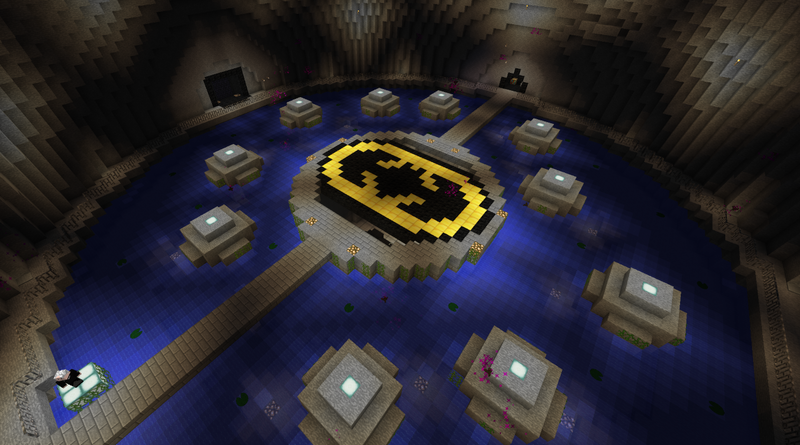 Located at spawn at "/warp casino"
Donate - You can donate to the server here if you wish to do so! We currently have donor ranks, MCMMO levels, and global Haste IV for 4 hours! You can also type "/donate" in-game for a link. Discord - Join the Discord channel to chat with others on the server! Check the home page for a link to join. You can download the program on your computer, the app on your phone, or just join in your internet browser! Server Restarts - Our network has scheduled restarts to help keep the servers running smoothly. Vote on our listings to get "/fly" time to use on your island! Your time only goes down when you are actually flying in the air. You will get Tokens when you vote. "/tokenstore" or "/ts" to access the store. You can get a Key to use at the Voting Crate at Spawn, as well as other goodies! Player Nicknames/Usernames - Open chat and hover over a player's name to see what their username is, along with other neat information! Cobblestone Generator - Did you mess up your generator and get Obsidian? No worries! Right Click the Obsidian with your Bucket to get the Lava back! Type "/newbie" in-game to be taken to the Starter Island Tips and Guides section of spawn! There are useful tips there, and a model of a basic cobblestone generator on display! Note: You may find problems with AFK machines as we have implemented methods to prevent AFK grinding. Discord - Join the Discord channel to chat with others on the server! Click here to join. You can download the program on your computer, the app on your phone, or just join in your internet browser! Type "/menu" in-game for more info! Type "/changelog" in-game for a link to our changelog to keep up with changes or additions we make. For any Minecraft related info, check the Wiki! Here I have listed most of the commands you can use on our server, with a short description of each. Server Selector - Use this to switch between servers! 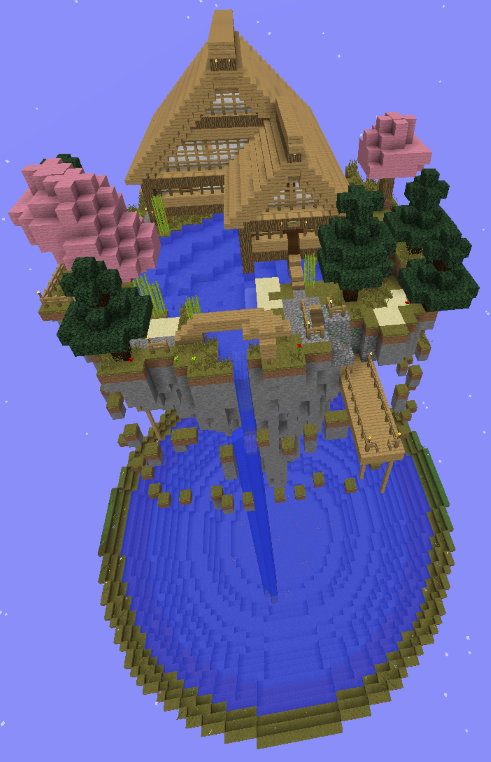 Skyblocks, Economy Survival, and Plots Creative. 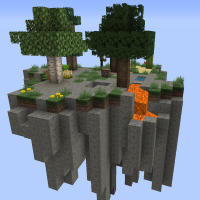 /is - Skyblock island menu. /parkour - Teleport to the Parkour lobby. /dun - Teleport to the Dungeons lobby. /warp shop - Teleport to the Spawn Shop. /rules - Basic rules, gives link to full rules. /site - Gives a link to our website. /faq - Gives a link to our Welcome + FAQ thread! /is trust - Trust other players to access your island! Includes building, destroying, access to containers, farms, animals, etc. /gadgets - Guide to how to make gadgets like the multi tool or a special sword! /party /friend /clan - for making friends, parties (temporary), and clans (permanent). /gtoggle - Toggle between Local Server and Network Global chat. /perks - Brings up the perks menu. Purchase abilities and other things for yourself and your island! /mp or /memberplus - Shows information on what the free Member+ rank gives you and how to get it! /mpisland - A special island that only Member+ players can access! Includes loot chests, trades, and the Flight Permits NPC! /list - Tells you how many players are online, with a list of their names. /color - Shows all the colors and formatting codes. /pshop - Brings up the Player Warps menu. Sorted alphabetically. /dailybonus - Get extra vote tokens daily! Members receive 1 token, Member+ receives 2, Grass Iron and Gold Donors receive 3, Emerald and Diamond receive 4, Obsidian receive 5. /changelog - Gives a link to our changelog, so you can keep up to date on what's been changed or added! /tags - Brings up a menu with the tags/titles you have available to use. /donate - Gives a link to our server shop! /redeem - Redeem the points given from the Welcome Pack for Member. AutoSorting - /autosort chests /autosort inventory /depositall /autofill ~ You can also use Shift+Left Click on a chest. /shop - Opens the menu for the auction house. /auc - Auction items off to online players thru chat! /vote - Explanation on our Voting system. Includes the vote links. /voteinfo - Made for players who cannot see the "Vote Information" hover tooltip. /pvp - Teleports you to the PVP arena lobby. 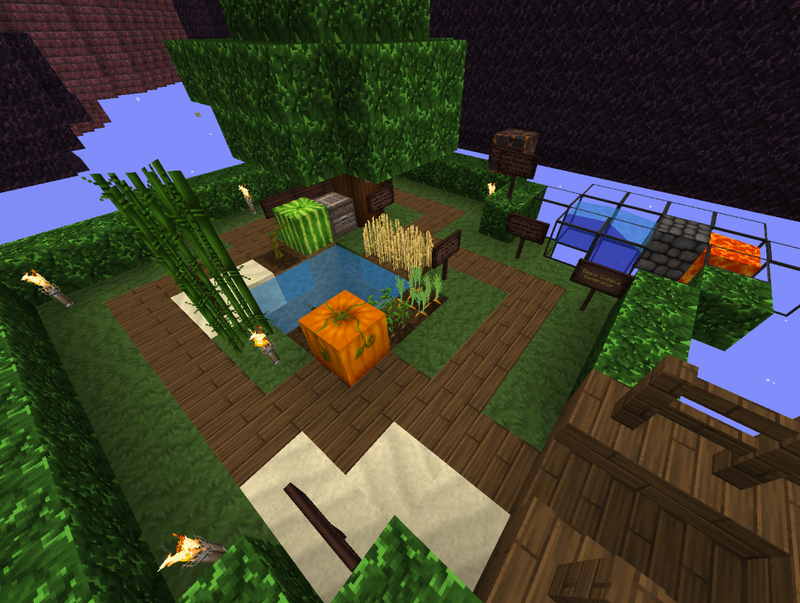 /skypvp - Teleports to the Swamp arena. /ft - Fast Travel - opens up the fast travel window. Same as the Dungeon Guide at /dun. Only works at spawn or dungeon world. /glist - Lists online players on all servers. /stats - Shows stats about your character. /played - Shows how long you've played on DOD. /dice <playername> <bet amount> - Bet and roll against another player for Skybucks! /dicepoker - Play dice poker against the computer. /sfbar - Use this to disable the SlimeFun notification bar. 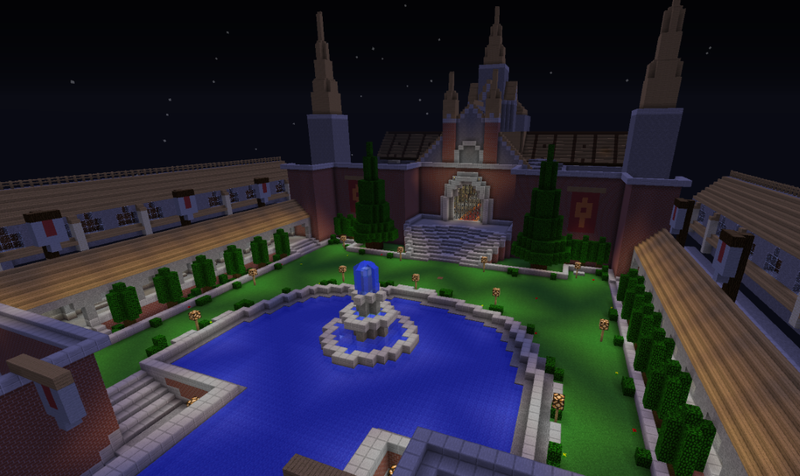 Dungeons, Challenges, and other activities on the Server. Parkour gives you money when looting the chest at the end as well. When you kill mobs that are in Dungeons you get money. When you Vote, and get a key for the Voting Crate at spawn, you have a chance to receive money and other items. You can sell items to players by hand privately, use /auc, /shop, or set up SignShops on your island. Sell items to the server using /sell. You earn money by completing Challenges. You can earn more money from Challenges, a neat title, and access to a special Member+ area by applying for Member+. How do I invite someone to my island? "/is invite (name)" then that person has to "/is accept"
WARNING: When you create, leave, join, or reset an island, your inventory is cleared! How big are the islands? The island size is 247x247. There is a 1-block gap between islands. Can you add things to the spawn shop so I can sell items to spawn? No. This would unbalance the economy that we have. There are plenty of ways to make money. See the above question. How do you get Seeds? Bonemeal a Grass Block, then punch the grass that grows. You can get Bones from Skeletons that spawn on your island, or in Dungeons. Or you can buy the Bones/Bonemeal/Seeds from other players. Nope! Fire spread is turned off. My vote didn't work! What happened? You most likely did not complete it correctly. Make sure you solve the captcha correctly. Make sure you put your name in EXACTLY as it is in game. For example, my name is FaliniFyreheart NOT falinifyreheart. Make sure you click the Vote button. Did you get a confirmation page? I didn't get my vote rewards! Make sure you use the "/claim all" command. This is in place so you can receive the tokens on the server of your choice. You can spend tokens in the "/tokenstore" or "/ts" which includes fly time, special tools, weapons, keys for the Voting Crate at Spawn, and player heads! You can see what you can get in the crate by left clicking it. How do I get more Dirt? 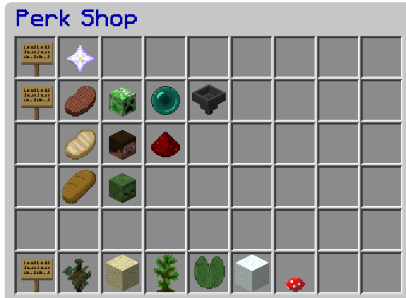 You can get more Dirt by buying it at the spawn shop at "/warp shop" ... You can earn more Dirt by doing Challenges and Parkour. Some give Dirt as a reward! There is also a chance to get Dirt/Grass by Voting and getting Voting Crate Keys to use at Spawn. Some player shops have Dirt for sale as well. How do I go to the Nether? The Medium challenge "Adept Builder" on the 2nd line gives you the Obsidian you need to make a Nether Portal! Or you can buy Obsidian from players. Can I get to The End? Yes! 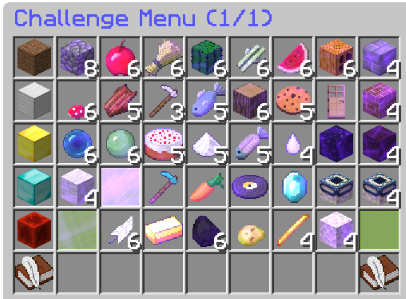 One of the last Skyblocks Challenges on page one gives you the materials needed to travel to The End. How do I increase my island level? It's simple - build! Some blocks are worth more than others. Stone Bricks are worth more than Cobblestone. Ore blocks are valuable, such as Emerald Blocks and Diamond Blocks. You'll figure it out! Tip: Variety is the spice of life! How do I craft this item? "/erecipe (name)" to see how to craft it! For example, "/erecipe repeater"
How do I get animals on my island? You can earn Spawn Eggs by completing Challenges, doing the Archer Dungeon, trading at Member+ Island. You can also buy/trade for them from players. Sometimes there are special events or parkour that may give spawn eggs! How do I activate my MCMMO skill? Hold the correct tool (or empty hand for Unarmed) and Shift+Right click to activate your skill. I died, can I have my stuff back? I'm sorry, but if you died, you died. That's just part of Minecraft. We don't have KeepInventory on for a reason. This is Skyblocks and it is meant to be a challenge. However, if you died because of a glitch or bug in the system, please let a staff member know about it or submit a ticket with what happened, what time it happened, including your timezone! Can you make a public mine or experience grinder? The public mine would take away from the feel of Skyblocks. Players can make Cobblestone and Stone generators. You can get all kinds of ores from completing Challenges, and doing the Parkour and Dungeons. Players can also make their own experience grinders. Make a mob farm, but don't make the fall fatal. Just enough so they'll live but be hurt! Can you sell spawners? Can you let us earn spawners? Check out this thread for information on this. Can I have a nickname? If you purchase the Grass Rank from the Donation Store, you will have access to "/nick" with colors, along with some other cool perks! What do the donor ranks get? You can click "Donation Store" on the top bar and click on the picture of each rank to see what you will get. You can also check out the donor rank guide here. When you buy a rank, you get all the previous rank's benefits as well! How do I make a SignShop? Place the chest you will have your shop items in. Put in the items and quantity you want to buy/sell for each time someone clicks. Anything can go in the description lines. Use a Redstone Dust to left click the chest, then the sign. This will link them. Redstone in hand, left click the chest then the sign. Now that it's linked, you can stock the rest of your chest. When you left click on someone else's SignShop sign, it will tell you what you're buying/selling, how many, and for how much. When you right click, you will buy/sell. How do I summon MCMMO pets? Hold 10 of the item required, and Shift+Left Click the ground. 10 Raw Fish for a Cat, 10 Bones for a Wolf, 10 Apples for a Horse. Will the block values be made public? Will you make a post on it? How do you get Heads? You have a rare chance to get them from usual Minecraft mechanics. A wither skeleton has a 2.5% chance of dropping a wither skeleton skull when killed by the player or tamed wolf. Skeleton, wither skeleton, zombie, and creeper heads are dropped by the respective mob if it dies due to a charged creeper's explosion. You can get them from the Slayer title in /perks and from special events! You can also get them by killing mobs in general, or in dungeons! Your rank on the island top leaderboards. "/istop"
How do you get to the other Island Top pages? "/is top 2" "/is top 3" etc. Can I glitch to the top of the Nether? You could, but you will get teleported away as soon as you go up there. This is to prevent abuse. Is there a way to prevent a specific mob from despawning? There sure is! Name a Name Tag and use it on the mob you don't want to disappear. 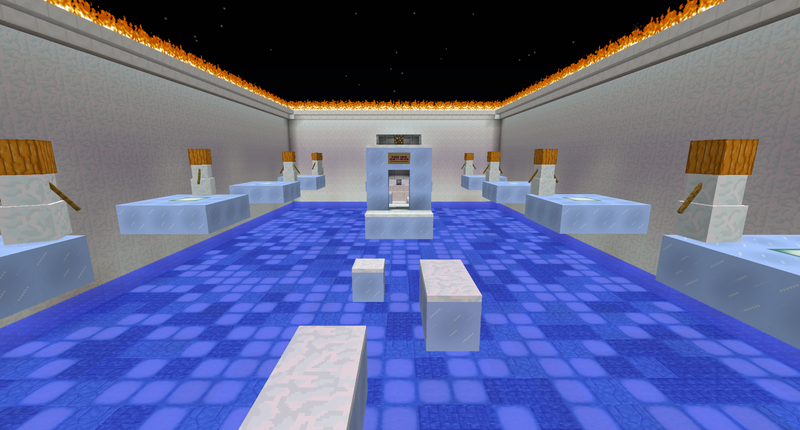 Note: Renaming a Spawn Egg does NOT work! Could I have a birthday party? You sure can! Make sure to post your birthday HERE and we will try to have a party on your special day! I got my username changed and I can't do anything on my island! What do I do? Send in a /ticket, including your old and new username! Considering making an in-game place with this information and visual guides. A new /newbie area perhaps. For now, keeping this information here. If you accidentally turn your Lava into Obsidian, use your Bucket to get your Lava back easily! Once you come across a Magma Block, you can use that for your Cobble Gen instead of Lava. This is safer and prevents Cobble loss! 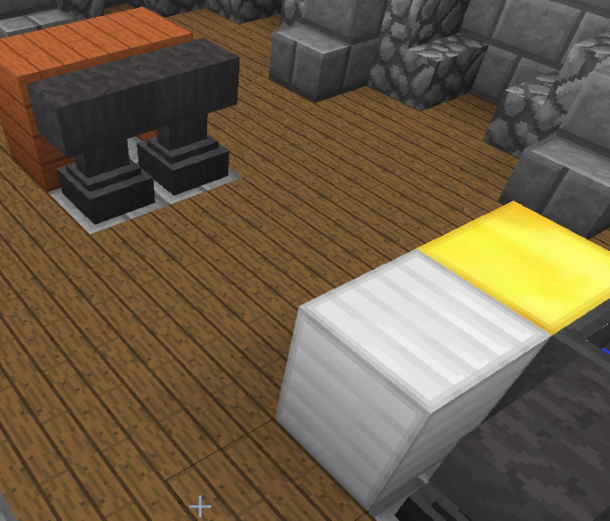 You can also put a Hopper and Chest below where the Cobble forms to catch the blocks as you mine them. Keep your island well lit to prevent getting killed by mobs. Have a dark platform for mob spawning. To begin, a cobble gen and a small tree farm will help you expand. Using slabs instead of full blocks will double how much you are able to expand! This is useful early on. You can also build the slabs on the bottom half of the block so mobs won't spawn. Make a platform of your entire area at a low Y level (Y1 or 0.5 if you can). This will prevent you from losing items and falling into the void. This will also grant a huge boost to your island level. Use "/vs toggle" to enable or disable the void saving teleport. If it is enabled, if you fall into the void you will be teleported to a safe spot, but you will have 1 Hunger left. 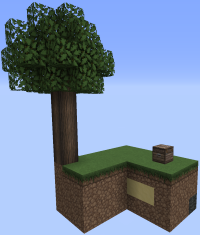 2x2 trees provides more Wood. MCMMO's Treefeller is very useful for chopping down trees! Shift + Right Click with an Axe in your hand, then chop the bottom log of a tree. Melons and Pumpkins need 2 Dirt: One for the seed stalk, and one for the Melon or Pumpkin block itself. Sand and Dirt make Sugarcane grow the same, so use whatever is easier for you to get. It is recommended to save Sand for Cactus and Glass. Play with a friend - Teamwork is faster, more fun, and more productive. Keep the bare necessities in your inventory when going around your island. This way in case you die and lose things, it won't be as bad. If you find yourself falling off your island and can't fly in time, or have no /fly time, type "/ih" to quickly return to your island home! Then at least your items will be safe on the floor of your /ih. Crop farms will help you complete Challenges, and keep your hunger bar full! You can also "/sell" some crops for $Skybucks. Upgrade your Cobble generator when you can, or even make a Stone gen! There is a free Member+ rank you can obtain! Doing /mp in-game will show you more info and give you a link to the forum post. Member+ gives you a custom Tag, +5% money from challenges, a bonus token when using your /dailybonus, access to /is trust, and /mpisland, a special area with free loot and trades! /perks, biomes, tpa, light eater, island warp, etc. Mob farm tips - mob cap limits, link to basic mob farm..
Parkour and Dungeons for fun and loot for more materials, money, exp. SF tips? Composter, Saw Mill, Androids, Armor, Other items like Infused Magnet..